Sean uploaded this to his Flickr site on 5 January 2008. This picture challenges me to write something in response to its bleak and smoky setting. No doubt a busy work place for many with noises of clanking iron and squawking seagulls beneath the heavy curtains of cloud or smoke. But there is a hint of a warm colour here. 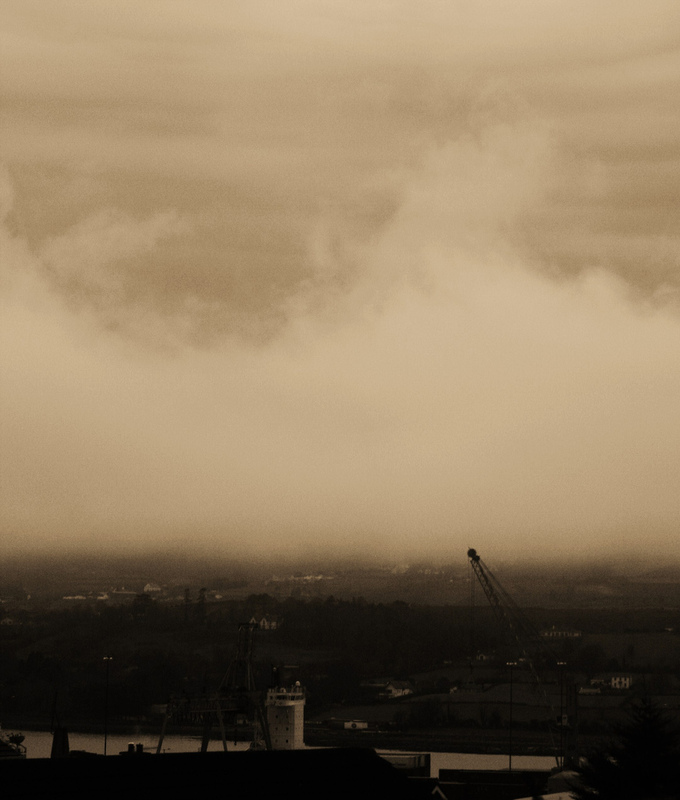 Perhaps that is what attracted Sean, that and the layers of cloud with a crane piercing the sky line. I had to google Warrenpoint Harbour to see other pictures with more definition and colour and for other perspectives. Though this picture conjures a meloncholy day it is not so much a cold scene, but more a glimpse of the heart of things, not always pretty but real, pumping and awash with life at every window and street corner. There now, I feel better already! Anyone else have a go? Hello PapaG … thank you for this … a pretty good effort, I think! It’s probably quite a ‘mature’ photo for Sean to have taken at 16 … more understated than most of the others he was doing. When I directed someone who knows a lot about photography to his Flickr site, this was the one she singled out for praise. Good evening. I like the sepia effect. The moody skies are quite wonderful and there is a sort of heroism about the human activity that goes on beneath them. I like the crane. A very mature photograph indeed. Art. Thanks, Cymbeline … yes, quite moody, and out of keeping with the Technicolor ones he was mostly taking at the time. I’m glad you like it. It could make a good book cover, I think. I was thinking of this photo again last night as I lay in bed. I was thinking the heavier and duller the cloud, so the closer the sky is to the horizon, as if the heavens were almost within reach. As for the book cover Brendano, are we talking about a novel? My question to you wasn’t really pointing at a book written by yourselt but wondering what type of book/novel might lie inside the cover of Warrenpoint Harbour as depicted by Sean. Would it be a tense thriller of a novel, a philosophical treatise or an historical account of the Industrial revolution? Whatever! As you have detected here, sometimes my imagination runs away with me! I have connections with Finland and a bewitching blonde! I spent one December there in 1983 and some mid-summers there in the late eighties but I could only tell you the stories over a drink! But I am due a visit there and must make it soon. Not this winter though. Perhaps I have mentioned Finland elsewhere and the summer antics . No, I don’t think so. Sounds intriguing, though.